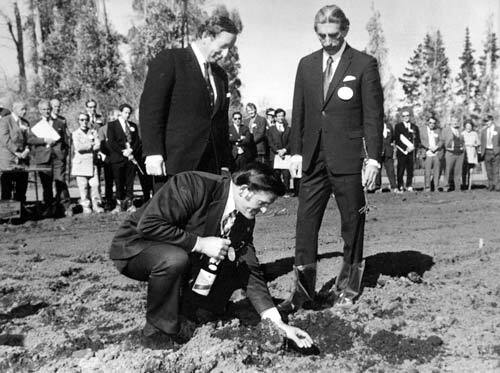 Frank Yukich of Montana Wines places a silver coin, a token of good fortune, in a hole in which a vine is to be planted, in 1973. Standing behind him is Montana chair David Beattie, later to be governor-general. Yukich sparked off the contemporary era of vineyards and winemaking in Marlborough when he followed the advice of Montana’s viticulturalist and bought up land for vineyards in the 1970s.